The second Ironman race of the weekend was a new event in Argentina – Ironman Mar del Plata. This first time race drew over 1,000 athletes to compete for 40 Kona slots. 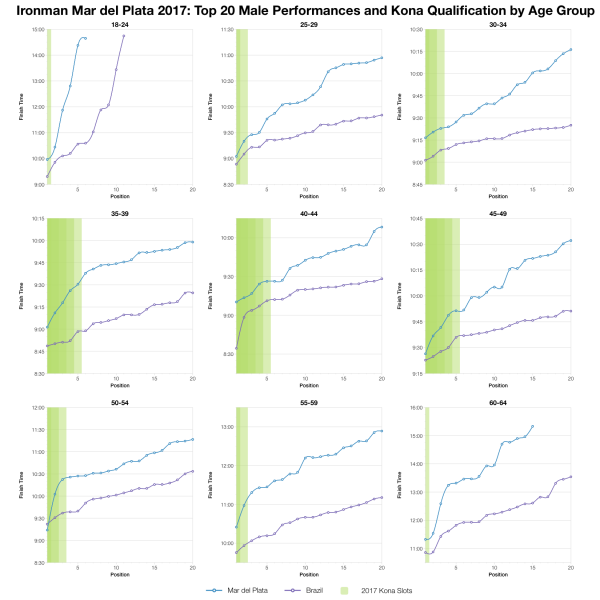 As a new race, there’s no history to assess the course against, so for this analysis I’ve included some data from Ironman Brazil as a quick comparison. I’m just comparing 2017 race results here – Argentina against Brazil. It should be noted that Brazil is a regional championship that carries more slots and should – at least in theory – have a more competitive field. It’s also a more established race with a larger field which can influence the distributions too. 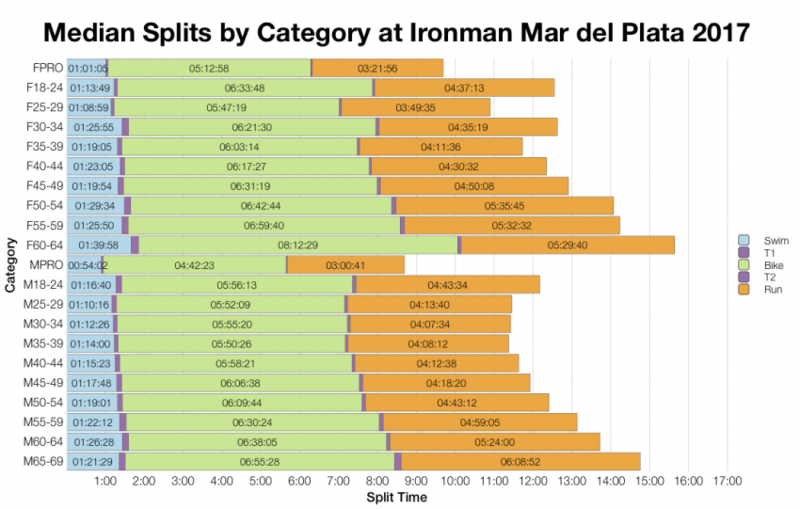 With that in mind we can see that Mar del Plata was a slower event in swim, bike and run. It’s hard to say how much of this relates to course and how much to competitors though. 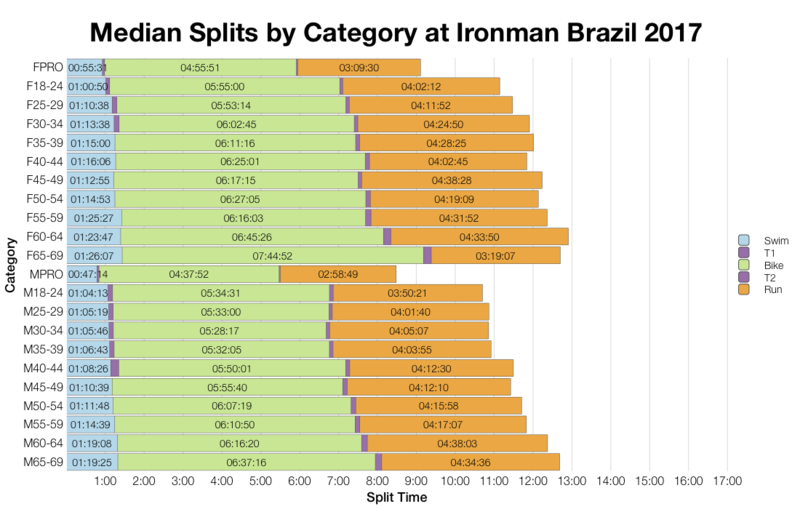 Ironman Brazil was a fast race this year, so while there are differences, ranging from 15-30 minutes in the overall distribution, it may not reflect huge differences in the courses. I do have some questions about the data I’ve extracted. There is a distinct lack of DNFs from Mar del Plata – athletes either finished or they are recorded as a DNS. It’s not impossible that every athlete completed the race , but I can’t recall having seen this before. The 0.8% overall figure is largely thanks to a handful of DQs on the day. I suspect the DNFs have simply been blanked in the result set Ironman has provided. As such, I can’t comment on this aspect other than to grumble about the inconsistency in the recording of results. Comparing medians follows the trends shown in the distribution charts. Again, we need to remember that Brazil was a faster, championship race. So we see mostly slower splits for swim, bike and run at the newer Argentinian event. The race drew a large local field and a lot of competitors from the broader region. Most slots remained in South America, but there was a European showing at the front of the race. 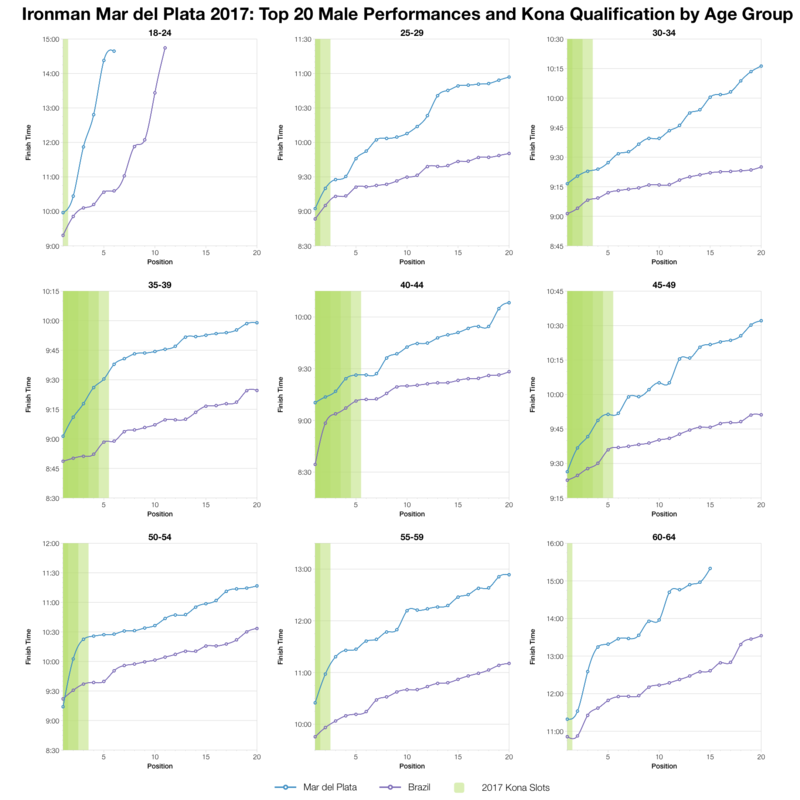 To give some context for the top 20 in each age group I’ve included the results from Ironman Brazil once again. The blue line represents Mar del Plata, the purple line Brazil. Argentina is the slower race, that’s consistent across age groups, but I wouldn’t describe the race as slow. Top twenty times aren’t too different to those we see on some North American courses, with some age group winners close to the 9 hour mark. Finally, based on the results list I’ve estimated the slot allocation for the race and from that the automatic qualification times in each age group. Final numbers might vary a little and roll down will impact the final qualifier times. You can compare this with other races on my Kona qualification page. It takes more than one race to assess a course. 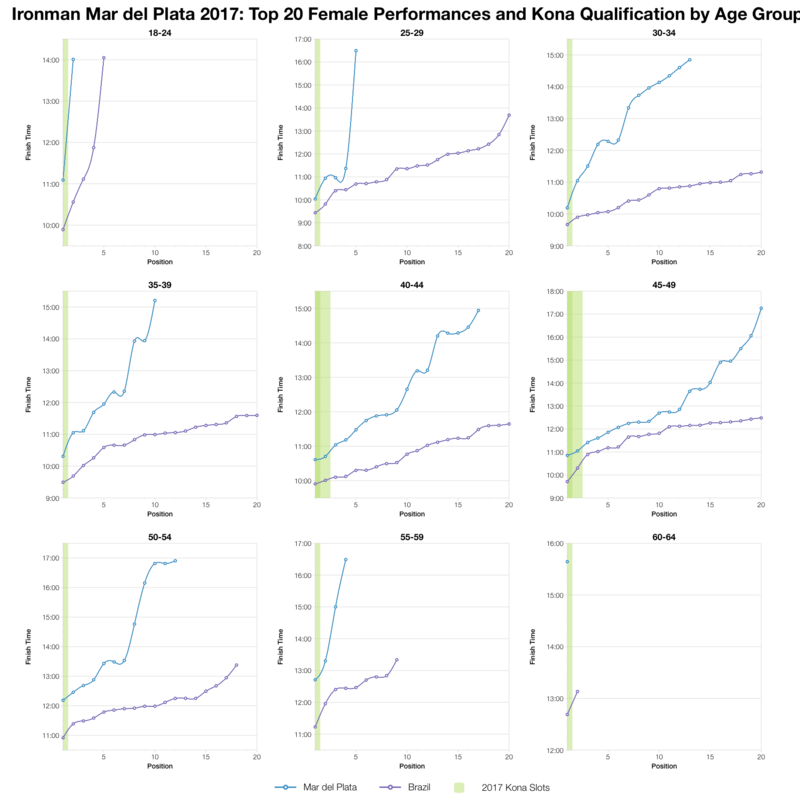 At the moment Ironman Mar del Plata seems to be slower than Ironman Brazil, but the later is a championship race and seems to be quite a fast course. Distributions of results don’t look too far off what might be called the ‘average’ Ironman though. 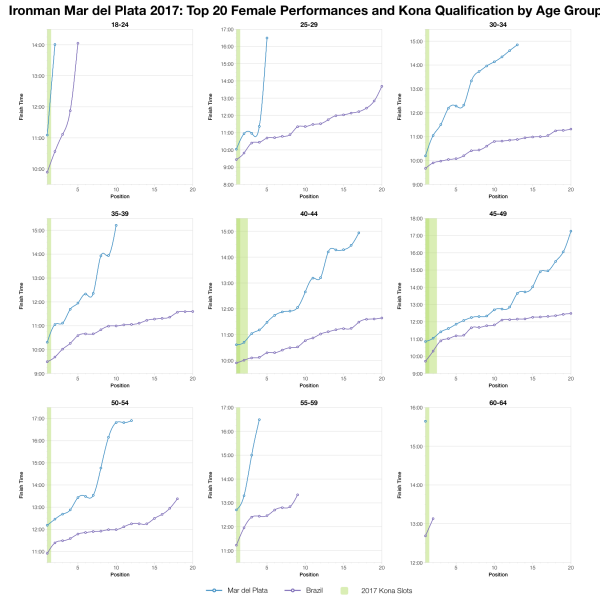 You can access a spreadsheet of the full results from Ironman Mar del Plata 2017 on my Google Drive.